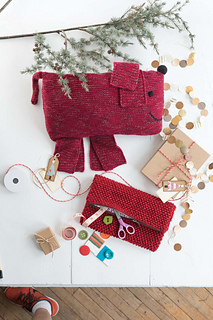 This clever pooch pillow is constructed from five garter-stitch rectangles (body, tail and three for the folded legs and ears). The eyes and mouth are embroidered in finishing. TIP: With a sewn-in zipper in the back, it’s a snap to remove the stuffing when Fido needs a wash.